Of course, nothing really happens in today’s world unless it exists on Facebook. 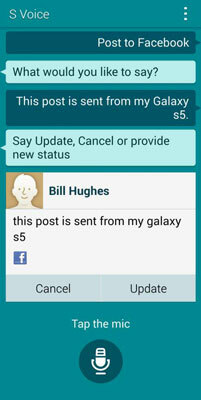 The Samsung Galaxy S 5’s S-Voice gives you the tools to update your status without going to the trouble of using your keyboard. 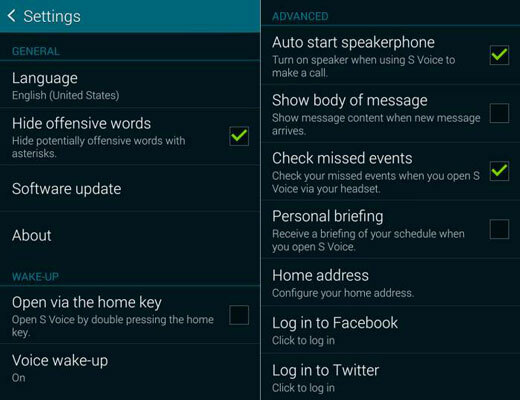 From the S-Voice screen, tap the Menu button. This brings up a pop-up menu. This brings up the options for S-Voice. Scroll down to the bottom. Tap on the Log In to Facebook link. If you haven’t already done so, log in to the Facebook app for S-Voice. 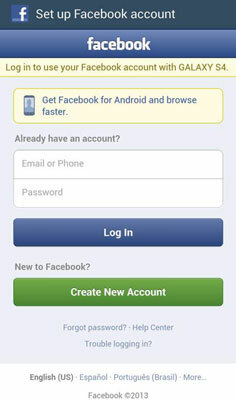 Enter your Facebook user ID and password. Ironically, you need to type in this information in the appropriate boxes. S-Voice won’t do it for you. This choice installs the app you need on your phone to log in via S-Voice. Now you are ready to post on your Facebook account. To do so, say “Post on Facebook.”. At this point, your words turn into text. The text is just like a typical post on Facebook. You share you status, and wait for your friends to Like it or comment.